Valhalla Ragnarök: Nordmann, löse 15g (1 Messlöffel) Pulver 30-45 Minuten vor dem Training in 200-300ml Wasser und trink es! Überschreite die 2 Poritionen 30g (2 Messlöffel) nicht innerhalb von 24 Stunden. 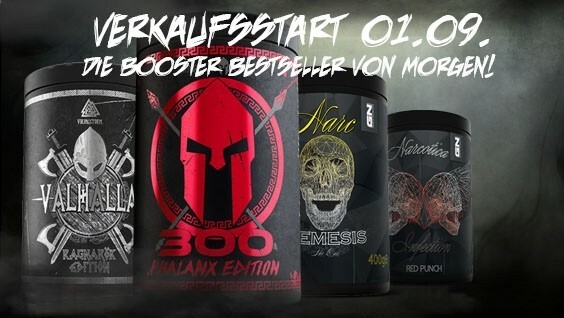 300 Phalanx: Spartiat, löse 30g Pulver 30 Minuten vor dem Training in 400ml Wasser und trink es! Narcotica Infection: Citrulline Polyhydrate, Arginine Polyhydrate, glycerol, Betaine Hydrochloride, Creatinol-O-Phosphate, Taurine, N-Acetyl-Tyrosine, Flavourings, Sour Cherry Fruit Powder, Beetroot Root Powder, DMAE, Hesperidin, Choline Bitartrate, Caffeine, Sweetener: Sucralise, Shisandra Chinensis Fruit Extract 2:1, Cacao Extract, Quercetin, Astaxanthin, Pomegrenate Peel Extract, L-Glutathione, Roseroot Root Extract 8:1, Green Tea Extract, Grape Seed Extract, Siberian Ginseng Root Extract 25:1, Magnesium Bisglycinate, Willow Bark Powder, Guarana Fruit Extract 1:1, Sodium Bicarbonate, Anti-Caking Agent: Silicone Dioxide, Nicotinamide, Cayenne Pepper Extract 10:1, Black Pepper Fruit Extract 25:1, Cyanocobalamin. Valhalla Ragnarök: Citrulline-DL-Malate, Arginine Hydrochloride, Beta-Alanine, N-Acetyl-Tyrosine, Taurine, Flavor Mixture, Flavouring, Beetroot Root Powde, Hesperidin, Choline Bitartrate, Caffeine, Sweetener: Sucralise, Shisandra Chinensis Fruit Extract 2:1, Cacao Extract, Quercetin, Astaxanthin, Pomegrenate Peel Extract, L-Glutathione, Roseroot Root Extract 8:1, Green Tea Extract, Grape Seed Extract, Siberian Ginseng Root Extract 25:1, Magnesium Bisglycinate, Willow Bark Powder, Guarana Fruit Extract 1:1, Sodium Bicarbonate, Anti-Caking Agent: Silicone Dioxide, Nicotinamide, Cayenne Pepper Extract 10:1, Black Pepper Fruit Extract 25:1, Cyanocobalamin. *reference intakte of an average adult (8400 kJ / 2000 kcal). **RI (DV) or NRV not established.